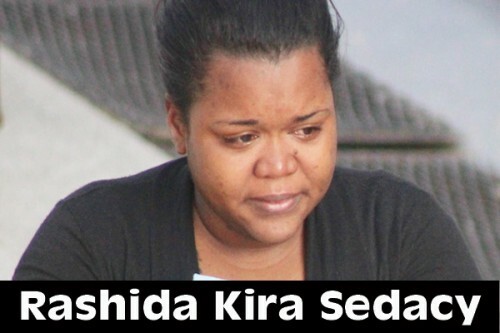 It took Magistrate Dale Cayetano almost two hours to read 117 counts of theft to Rashida Kira Sedacy, 24, as he arraigned her on the allegations that she stole $83,629.79, over a period of several months from her former employer, Traveller’s Liquors Ltd.
Sedacy, a resident of Los Lagos, was represented by attorney Darrell Bradley, who is also the Mayor of Belize City. She pleaded not guilty to all the charges and was released on bail of $15,000 plus two sureties of $7,500 each. Apart from ordering her to surrender her travel documents to the court, Magistrate Cayetano stipulated that Sedacy is to report to the Ladyville Police Station every week. On Saturday, March 15, police arrested Sedacy, who is employed as a secretary at Rangers Security, and she remained in their custody until this morning when she was returned to court. Her arraignment was originally to have taken place yesterday, Monday, but was delayed until this morning after the court’s bureaucracy experienced logistical difficulties due to the volume of the charges. The thefts occurred over an eight-month period, between January 2, 2013, and August 21, 2013. According to the information contained in a complaint filed by the arresting officer, Sergeant Bernard Reyes, during the month of January, Sedacy allegedly stole 14 times from her former employer. She committed the most acts of theft – a whopping 19 counts — in April 2013. For February 2013 she was charged with 14 counts of theft; 17 counts of theft for March of that year; 12 counts for May; 17 counts for June; 17 counts for July; and for August – 11 counts of theft—the least number of thefts in the 8-month period. In January, Sedacy allegedly stole monies on the 2nd, 4th, 8th, 9th, 10th, 11th, 14th, 15th, 16th, 17th, 18th, 28th and 30th. The total amount stolen in that month was $4,778.99. For February, the thefts are listed as occurring on the 2nd, 8th, 11th, 12th, 13th, 14th, 15th, 20th, 21st, 22nd, 26th and 27th, totaling $5,829,58. In March, the reported thefts were on the 2nd, 3rd, 4th, 5th, 7th, 8th, 13th, 14th, 15th, 18th, 19th, 20th, 22nd, 26th, 27th, and 28th, amounting to a total of $10,078.29. In April, the thefts reportedly occurred on the 2nd, 3rd, 4th, 5th, 8th, 9th, 10th, 11th, 12th, 13th, 16th, 17th, 18th, 22nd, 23rd, 24th, 25th, 26th, and on the 29th, for a total of $19,470.11. In May, it is alleged she stole a total of $11,551.13 over May 6th, 19th, 13th, 14th, 16th, 17th, 21st, 22nd, 23rd, 24th, 28th and 29th. In June, it is alleged she stole money on 17 different days, on the 3rd, 4th, 6th, 7th, 10th, 11th, 12th, 13th, 16th, 17th, 18th, 19th, 20th, 21st, 24th, and 27th – stealing a total of $16, 387.74 in that month. In July, she allegedly stole $6,966.99 on the following days: the 2nd, 9th, 11th, 12th, 15th, 16th, 17th, 19th, 22nd, 24th, 26th and 29th. For August, the total amount she stole is estimated to be $4,904.03, which comprises thefts that took place on the 3rd, 5th, 8th, 13th, 14th, 15th, 16th, 19th, 20th, and 21st. Sedacy’s next scheduled court appearance is on May 19. Her attorney, Bradley, urged the court to provide them with disclosure and the warrants for all 117 charges. Bradley noted that warrants are not normally included in disclosures from the Police Prosecution Branch. Although Sedacy was arraigned on 117 charges, according to the police press officer, she is charged with 128 counts of theft.